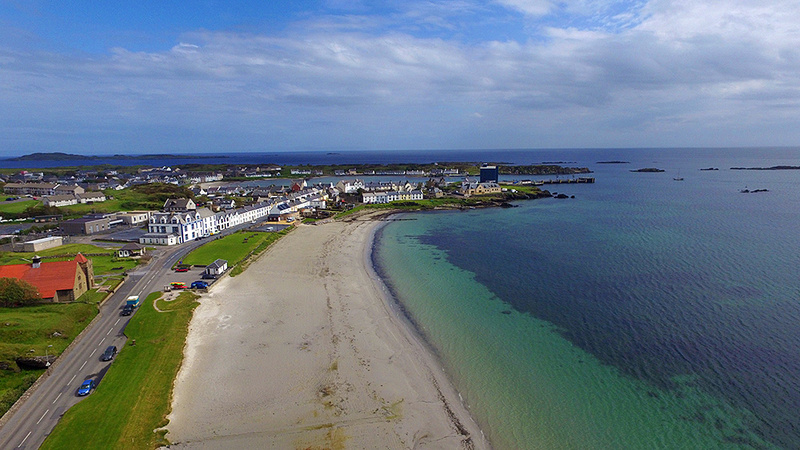 A view of Port Ellen from the air, looking down the White Hart beach towards Loch Leòdamais. Ramsay Hall on the left, Port Ellen pier towards the right. Texa can also be seen in the distance on the left. Taken from a DJI Phantom 3 quadcopter in June 2015. This entry was posted in Beaches, Cloudy Weather, Islay from the air, Landscape, New Post, Sea Loch, Sunny Weather, Village and tagged Islay, Loch Leodamais, Port Ellen, Texa, The Ard by Armin Grewe. Bookmark the permalink. Another beautiful photo of Port Ellen. Brilliant photo , just 1 complaint missed out North Bay. Maureen Hutchison & me Florrie Mac Intyre lived across from each other there , happy days . I spent many a Happy Summer in Bonahaven when I was young – loved it!! Had a great holiday in White Hart hotel. Nice to see it again. Thank you very much everyone for the kind comments, likes and shares, really appreciated. I still have a video from the flights around Port Ellen to edit, I hope to get that done in the next 4-8 weeks.